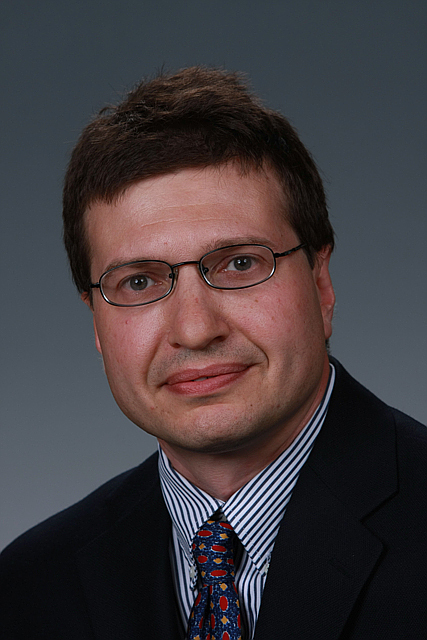 This month, Alexandre Tartakovsky, Associate Division Director for Computational Mathematics within PNNL’s Advanced Computing, Mathematics, and Data Division, was part of a specially selected group of scientists who participated in the 20th German-American Kavli Frontiers of Science Symposium, held in Potsdam, Germany. The annual symposium is co-sponsored by Germany’s Alexander von Humboldt Foundation and the National Academy of Sciences. The symposium, held March 10-13, included sessions focused on modifying genetic code, subsurface geomicrobiology in the deep biosphere, microbial control of host behavior, model reduction for complex systems, understanding oxytocin, examining photocromic systems, and solid-state materials for fault-tolerant quantum computation. These Frontiers of Science events provide a means for world-class scientists to exchange ideas, examine problems, and facilitate broader international cross-disciplinary research. Since joining PNNL in 2004, Tartakovsky’s primary research focus has been multiscale mathematics and uncertainty quantification with applications to flow and reactive transport in porous media and other complex natural and engineered systems. In 2008, he received the Presidential Early Career Award for Scientists and Engineers, recognizing his leadership in computational mathematics for subsurface flow and transport in heterogeneous media. He also earned a U.S. Department of Energy Early Career Research Program award in 2011. Since 1989, more than 150 German-American symposia alumni have been elected to the National Academy of Sciences, and 10 have been awarded Nobel Prizes. The National Academy of Sciences was established by an Act of Congress signed by President Abraham Lincoln in 1863, and members, elected by their peers for demonstrating outstanding contributions to research, provide independent, objective advice on matters related to science and technology. The German government established the Alexander von Humboldt Foundation to promote academic cooperation between leading international scientists and scholars.